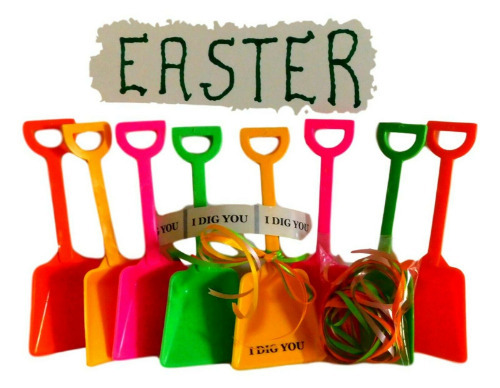 12 Mix of Easter Colors Orange, Pink, Yellow and Lime Toy Plastic Sand Beach Shovels and 12 "I Dig You" Stickers with Cello Bags and Ribbon. Brilliant in color shovels measure 7" tall x 2 3/4" across shovel. Free Shipping!! Manufactured in the USA our Shovels are Lead Free, Food Safe, Contain No BPA and are Recyclable. FREE SHIPPING!!! These shovels are shown on Pinterest and are very popular for Easter and other celebrations. 24 Red Toy Plastic Shovels & 24 "I Dig You" Stickers. 24 Kid's Childrens White Toy Plastic Shovels and 24 "I Dig You" Stickers.